For over fifty years, we have been designing, engineering and installing industrial mechanical screen, industrial louvered screen, mechanical equipment enclosures and architectural screening systems. 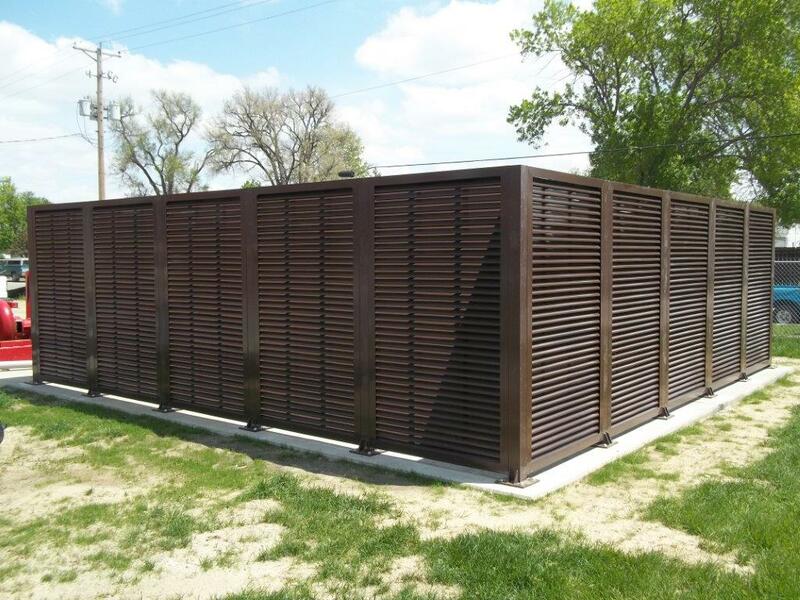 In addition to our custom louvered screen fabrication division, PalmSHIELD fabricates welded wire mesh screen, grating, and perforated metal screen. You can find our work from the base of the Grand Canyon to the midst of the Yellowstone Forest. PalmSHIELD is the ultimate architectural equipment screening. Please visit http://www.palmshieldlouvers.com. Our speak with our representatives at AmeriFence Corporation of Kansas City. Our fabrication division operates in a ten thousand square foot facility that provides complete fabrication and coatings. Our team is lead by a seasoned group of certified welders, coaters, project engineers and drafters. All we do is custom fabricate architectural products. Perforated metal, grating, industrial louvers and welded wire mesh screens are some of our top products. We have installed other manufacturer’s louvered screen systems over the years. Our experience with these systems was not satisfactory. Our systems are designed to overcome all of our challenges in delivery, installation and sustainability. Having installed hundreds of screen systems and thousands of gates, we know a few things about what works and what does not. What sets PalmSHIELD above all others is its fully framed manufactured panels and ease of installation. This rigid and robust frame protects the louvers, perforated metals, grating and welded wire mesh during shipping, installation and for years to come. No assembly required. Our gates are manufactured first as standalone gates. We then fit our PalmSHIELD infill panels. Our system is designed with the installers in mind. All of our panels and posts are factory aligned, then drilled and punched. All of our hardware is factory installed, removed and packaged. We are often not only the manufacturer but the installers as well. Our direct line of communication with the field gives us constant feedback and motivation to get it right. PalmSHIELD has designed it own line of industrial hinges: the Gorilla Hinge. This hinge uses a half inch thick plate to mount to both the gate and gate post. The Gorilla hinge has a slight offset on the hinge plates to allow the gate to slightly close past full close. This intended design quirk was incorporated because we realize that not everything happens exactly like you want it to in the field. Sometimes, the gate posts are set an eighth to a sixteenth of an inch out of square. This is not noticeable at the post but a typical hinge would not allow the gate to come to a full close if the gate post was not set perfectly square. We empathize with these field irregularities and believe it is our responsibility to find a solution to offer our customers some flexibility. PalmSHIELD louvered screening and perforated metals, welded wire mesh and grating systems are perfect for providing excellent ventilation while keeping items out of sight from others. Using the industries’ only picture frame design, each panel is rigid enough to stand on its own. Maintaining a consistent design throughout the system, PalmSHIELD can be configured as a series of screens, grills, swing gates and even sliding gates. PalmSHIELD is custom fabricated to each application, allowing end users to select the amount of visibility and air flow by varying louver spacing or degree of perforation. Louvers may be placed vertically, horizontally or even diagonally. PalmSHIELD is unique in providing the industries’ widest louver. Each louver is .1250 thick with an installed profile of 2” x 2.873” tall. Not only is the PalmSHIELD a larger profile but the entire profile is sloped providing less visibility and better air flow. Only PalmSHIELD uses a 3” x 3” x ¼” angle vertical supports. Each louver is welded to the vertical supports. Because of the larger vertical support, PalmSHIELD provides a 2 ¾” weld-able surface to attach louvers to the frame. We use this same robust frame for our welded wire mesh, perforated metal panels, and grating. What makes PalmSHIELD the very best louvered system is the use of a 3” x 3” x ¼” angle top and bottom cap. Most systems do not provide a rigid top cap. A top cap is critical in protecting the panel from falling debris, hail, etc. while the bottom cap protects the louvers from foot traffic and mowers. The vertical supports and horizontal caps are welded together to form the industries’ only picture frame design. This design provides a rigid framework to support the louvers, perforated metal, welded wire mesh and grating from twisting and warping also making it easy to remove and reinstall if necessary. PalmSHIELD uses a 2” x 1/8” aluminum flat bar not to exceed 24” apart to support the louvers between the framework. This support prevents intruders from attempting to spread the louvers apart to gain access. Larger than most systems, PalmSHIELD uses a 4” square x ¼” or 3/8” wall post. The larger and thicker walled posts is suited for high wind and snow loads. Posts are typically about sixty inches on center. All nuts, bolts and fasteners are stainless steel. If gates are incorporated into your system, only our Gorilla hinges will be allowed. After fabrication is completed, all materials are carefully sweep blasted and powder coated. The most important part to any coating system is the preparation of the materials. Sweep blasting removes any foreign debris and opens the aluminum up for adhesion. Custom colors are available. PalmSHIELD uses polyester powder coating in accordance with material hardness ASTM 3363 2H. PalmSHIELD is an excellent choice for any mechanical equipment screening, enclosures, rooftop enclosures, trash enclosures, etc.